I grew up in a northwest suburb of Chicago. I didn’t really have any idea what farm life was like until I met Nate. Literally, I went to a farm in kindergarten and remember liking the chicks. Little did I know one day I would call a farm home! I didn’t really think about where my food came from either. Farmers markets weren’t as popular as they are now. I loved going to the grocery store with my mom, and we ate on the healthier side, but I just didn’t think about it. As a teenager, when my parents would go to buy flowers and plants and bushes in the late spring, I would ask to pick out one flower plant and would try to keep it alive. I always failed, and deemed myself the opposite of a green thumb. Fast forward to meeting Nate. I remember one of the first times I went to Walnut Grove Farm, I posed for a photo with a cow; I was just so in awe. 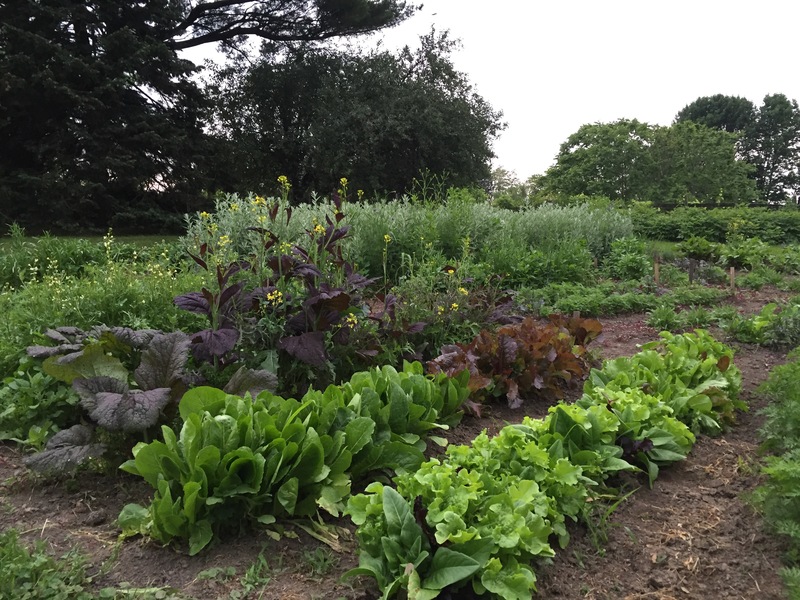 The spring and summers would come and go, and we would eat fresh veggies and fruits from the garden, something that was really foreign to me in the best way possible. As the years passed (we’ve been together for almost 15! ), I’ve grown to appreciate respect the farm, and love the production gardens. We were married there almost six years ago, featuring mostly local vendors and the majority of the flowers were from the farm. Fast forward even more to last weekend, when I pulled up probably 30 radishes and some green onions, picked fresh greens, and planted watermelons and squash to enjoy later this year. There is something so gratifying about harvesting from a garden. It’s difficult for me to describe. I find such peace in it. And excitement. It just feels right. 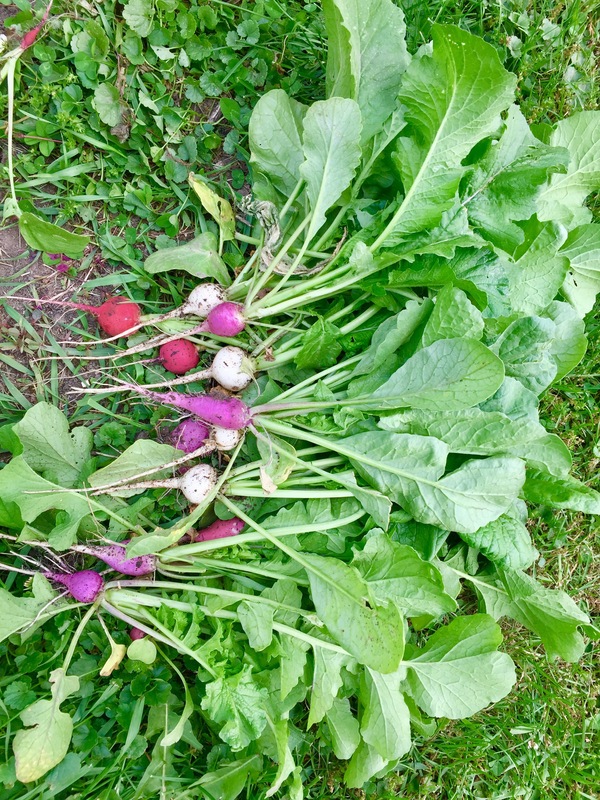 Radishes, in particular, are super fun (I realize what a nerd I sound like right now, and I’m completely okay with it) because it’s like a surprise with each radish. Is it mature enough? What color is it? Long and thin or short and plump? Will it be really sharp or mild in flavor? Not to mention they are beautiful. 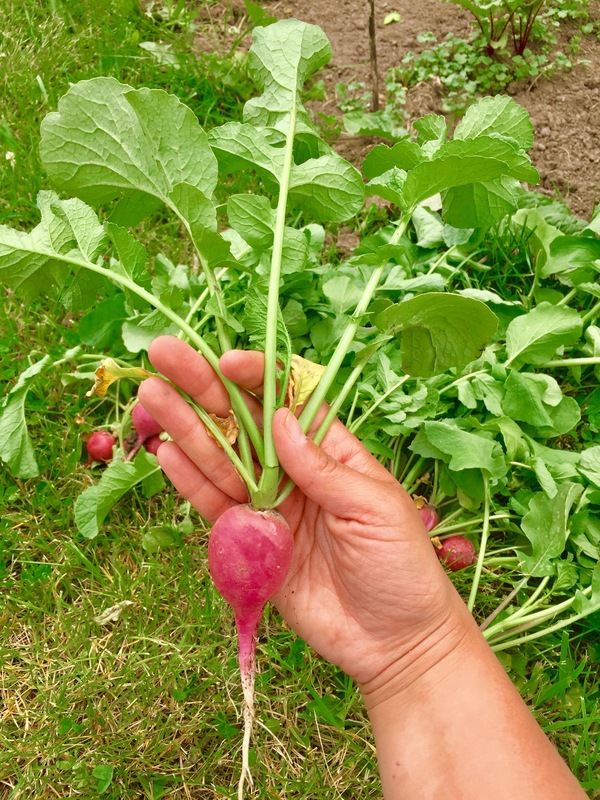 Radishes now signify the beginning of the growing season (other than another new favorite–rhubarb!). It means a summer filled with fresh foods that my mother-in-law planted and hopefully I can harvest. Gardening is something I’m not sure I’ll be good at on my own, but I really hope one day Nate and I will have the land to have our own garden. 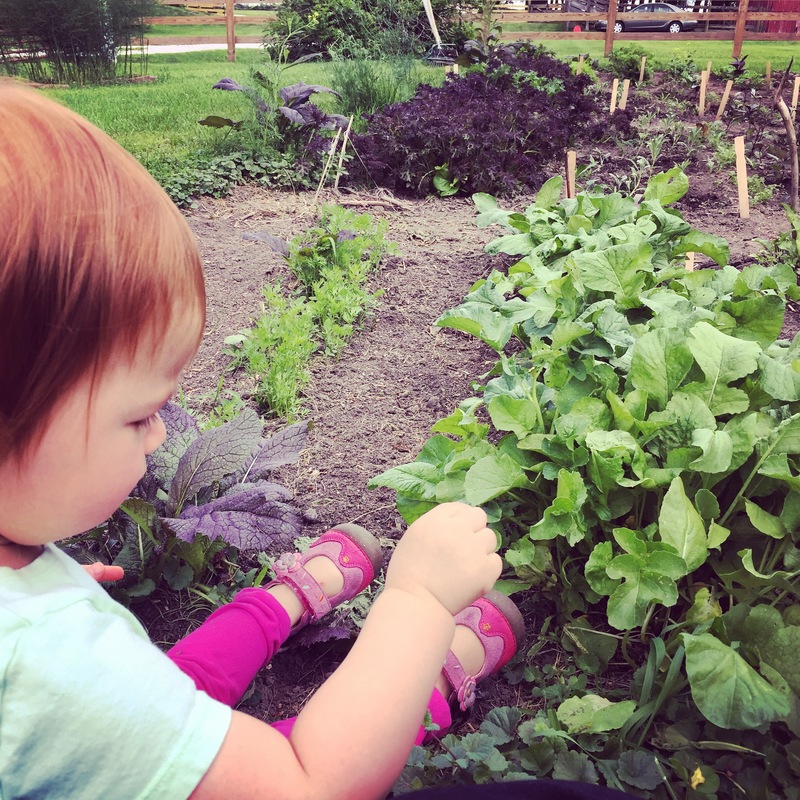 Teaching Eloise about the farm, the gardens, and about the foods she eats; getting her to eat a lot of fruits and veggies; and trying new foods are very important to us. Today, Ellie wanted blueberries instead of a bakery cookie. That to me was a small, simple parenting win. And I’ll take them however they come! I’m so grateful she has the farm as her home away from home, and that’s all that she knows. It gives her balance from the hustle and bustle of the city, the ability to run and be free, and spend quality time with her family with home-cooked, home-grown meals. What could be better than that?